Thanadelthur was a young Chipewyan woman who, in 1713, was captured and enslaved by a Cree raiding party that had penetrated deep into her people’s traditional lands southeast of Great Slave Lake. The capturing of slaves was common particularly during the decades following the 1670 establishment, on the Hayes River (southwest shore of Hudson Bay) of the Hudson’s Bay Company fur trading post of York Factory. Guns were traded to the Cree and they used these against their neighbours to not only keep them away from York Factory but also in slave capturing raids. During the early winter of 1714 Thanadelthur escaped from her captors and though starving and cold managed to reach York Factory. Journals kept at this fur trading post refer to this young woman simply as “Slave Woman”. Governor James Knight was impressed by her courage and intelligence. She told of the fine furs her people had and of their desire for the Hudson’s Bay Company to build a trading post closer to their territory. 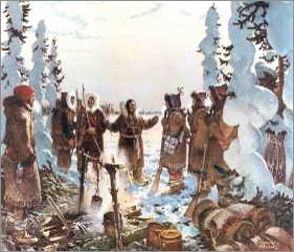 Thanadelthur was asked to guide HBC clerk William Stewart and 150 Cree on a journey northwest from York Factory towards the East Arm of Great Slave Lake. After a long and arduous journey she found her people and it’s said that it was through her powerful and persuasive speech, and the promise of a new trading post closer to Chipewyan territory, that peace was negotiated between the Cree and Chipewyan. A new trading post was built in 1717 near the mouth of the Churchill River. This post was at first called Fort Churchill but after a few years was renamed Prince of Wales Fort. For almost a hundred years it was the principal source of trade goods for the Chipewyan people of the Northwest Territories. Unfortunately Thanadelthur didn’t live to see the benefits her courageous journey brought to her people. She returned to York Factory to become Knight’s advisor but fell ill and died at the age of 17 in 1717.